In 2014, AuPairWorld, the award-winning service provider for host families and au pairs, completed another year of outstanding growth across diverse international markets and in its two main user groups. New partnerships with other au pair agencies and service providers will be a highlight for 2015. Growth rates in host family registrations of between 10 and 25% percent were seen in important AuPairWorld Western European national markets such as Great Britain, Spain, France, Italy and Ireland. Growth in Germany was more modest at 5%, while Australia continued to gain in importance with a growth rate of 28%. With 326,400 new au pair registrations in 2014 (299,230 in 2013), AuPairWorld clearly continues to hold a strong and growing appeal for young people interested in an au pair placement. The large number of au pairs and host families actively using the website gives both of these groups a wide range of attractive choices for arranging an au pair stay. AuPairWorld's popular services have made the company the global market leader for au pairs and for host families who are seeking one another and are interested in taking advantage of the multiple benefits of the au pair experience. As recognition of this, the company was pleased to receive the prestigious “Hessen Champion Award 2014” from the Hessian Ministry of Finance as Global Market Leader in its business segment. AuPairWorld's popular matching services are supported by a wealth of web-based advice and information about au pairing that is constantly being refined and developed. Excellent as these information offerings are, there still is a missing dimension of support for the au pair experience that AuPairWorld is now moving to fill. Au pairs are young people far from home in an unfamiliar environment – this lies at the heart of the experience. In this position, they (and their host families) can benefit from on-site support. AuPairWorld is currently developing two new business models to deliver this type of support. In many countries, there are traditional au pair agencies that have extensive experience and a high level of expertise in managing the whole range of au pair requirements. In the Netherlands, AuPairWorld has developed a pilot program that connects the pre-matching services provided by the AuPairWorld website with the on-site support and expertise provided by local au pair agencies. AuPairWorld's cooperation with three Dutch agencies gives host families in the Netherlands the option of making their own choice of an au pair in a so-called pre-match. Then the host families can contract the services of one of the AuPairWorld partner agencies and receive full support during the au pair stay. Working on this principle, AuPairWorld will be seeking to develop partner relationships with selected au pair agencies in 2015. The idea behind this type of cooperation will be to connect different elements of what might be called the supply chain for au pairing services and thus to provide au pairs and host families with a greater range of service options while at the same time creating new synergies and growth potential in the overall au pair business. Currently host families and au pairs are confronted with an unfortunate either/or choice in arranging an au pair stay. Either they use the popular online matching functionality and support of AuPairWorld and manage the other aspects of the au pair stay independently, or they go to an agency which provides comprehensive support including searching and selection of the au pair. For host families and au pairs, it becomes possible to combine different services and specialities in a more flexible and individualised way. For the selected partner agencies, new sources of customers can be tapped into and new opportunities to provide expert, locally based services should arise. For the au pair model as a whole, new more highly differentiated models of cultural exchange and family care support become available which can contribute to the continuing growth and popularity of au pairing worldwide. In January of this year after much preparation, AuPairWorld founded a new affiliated company AuPairWorld Local Services. This company has launched an innovative new model for delivering locally based, well informed, consistently structured support for au pairs during the au pair stay. This support is provided by so-called LocalCare Coaches, locally based natives of the respective host country with extensive au pairing experience (typically as veteran host parents) who work as independent representatives of AuPairWorld. With the LocalCare model, AuPairWorld provides a carefully structured set of guidelines and procedures for managing the au pair support. Au pair clients come to the LocalCare Coaches through the AuPairWorld website as well as the newly established LocalCare website. Working with the LocalCare structures and support from headquarters, the LocalCare Coaches serve as experienced adult advisers for the au pairs. They support their au pair clients through regularly scheduled personal meetings, phone calls and social get togethers, in addition to being available for any necessary troubleshooting or crisis management. LocalCare has been launched first in Australia with the LocalCare Australia website going live at the beginning of February. Based on the experience in Australia, a further roll out in New Zealand will be considered as well as possible LocalCare launches in other popular au pair host countries such as Great Britain and Ireland. Different customers have different wishes and no single model can fulfil all of these desires. For some host families and au pairs, the web-based support provided by AuPairWorld together with their own hands-on involvement is just what they need to feel comfortable and satisfied in arranging an au pair stay. Another group (that currently is not explicitly addressed in the market but which increasingly requests to be recognised and served) will prefer a mixed model, using AuPairWorld for the search process and a partner on-site agency for ongoing full-service support during the au pair stay. Still others can benefit from the clearly structured input from a LocalCare Coach that gives au pairs help in orientation and adjustment in the new host country environment. And some host families and au pairs will wish to have all aspects of the au pair stay managed by an agency from initial search and selection to final departure at the conclusion of the au pair stay. For AuPairWorld, the key principle is to pay close attention to real customer needs as the basis for developing new services and options for au pairs and host families. Customer satisfaction is always what counts most. Au pairing can only live up to its idealistic potential when both target groups – au pairs and host famlies – are receiving truly desirable benefits and enjoying the classic win-win experience that lies at the heart of the au pair model. When this happens, the overall potential for the au pair business as a whole and for all of the actors who serve it will continue to expand. Growth was strong in nearly all of AuPairWorld's user groups and markets. The graphs and tables below give a detailed overview of the developments in AuPairWorld's two main user groups of au pairs and host families. 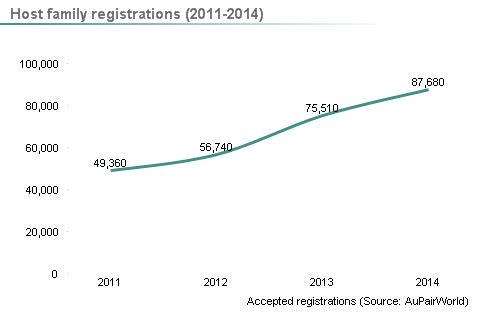 Total accepted registrations for au pairs and host families exceeded 400,000 for the first time in 2014. For the two groups there were 404,080 newly registered users, making for a fifth year of double digit growth (10%) for AuPairWorld. See below for more detailed information about au pair and host family developments. 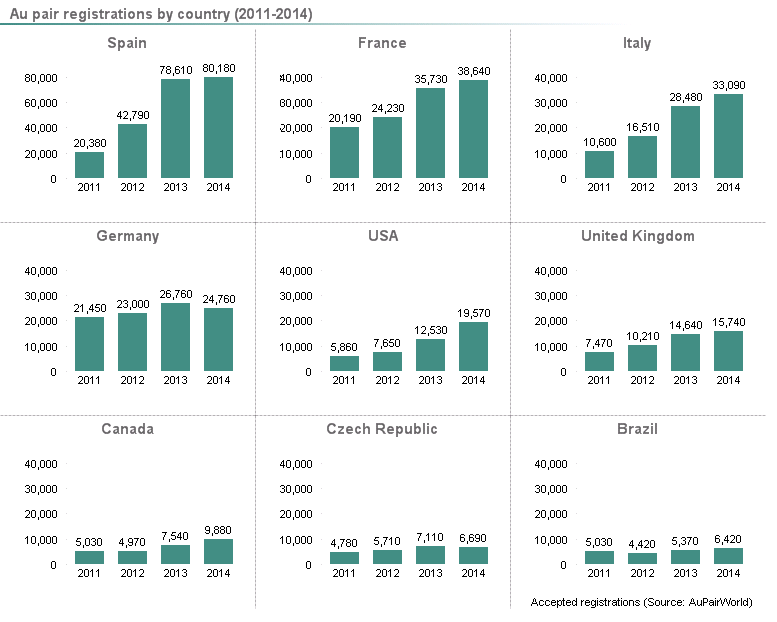 Following 2013, a year of unprecedented 45% growth in accepted au pair registrations, the 2014 increase of 9% is seen as healthy ongoing expansion in the au pair user group. All national markets participated in a general upward trend with the exception of Germany and the Czech Republic, where there were slight declines in au pair registrations. The 58% upsurge in au pair registrations from the USA (to a total of 19,570) is an interesting development, as is the 31% increase in registrations from Canadian au pairs (to a total of 9,880). It seems that young people in both North American countries are becoming increasingly aware of the importance of developing intercultural and second language competence and the significant contribution au pairing can make in acquiring such skills. Italy also experienced strong growth in 2014 with a 16% increase in accepted au pair registrations to a total of 33,090. 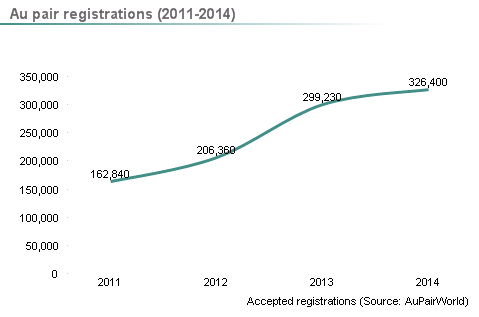 Growth in host family registrations in 2013 was also unusually high at 33%. The 2014 growth rate of 16% to a total of 87,680 following such a strong year in 2013 is seen as a favorable development, indicating the continuing upward potential in the European market. The conversion rate of host family registrations to Premium Memberships remained at an acceptable level of 85%, down 2% from the 87% level in 2013. The overall increase in purchased Premium Memberships from 65,685 in 2013 to 74,805 in 2014 (for a growth rate of just under 14%) represents a good result. All national markets contributed to the overall 16% rate of growth in registrations with the exception of Switzerland and the Netherlands, where the development was basically flat. Continued strong host family registration growth in English-speaking countries, which remain very popular destinations among au pairs, was a positive development. 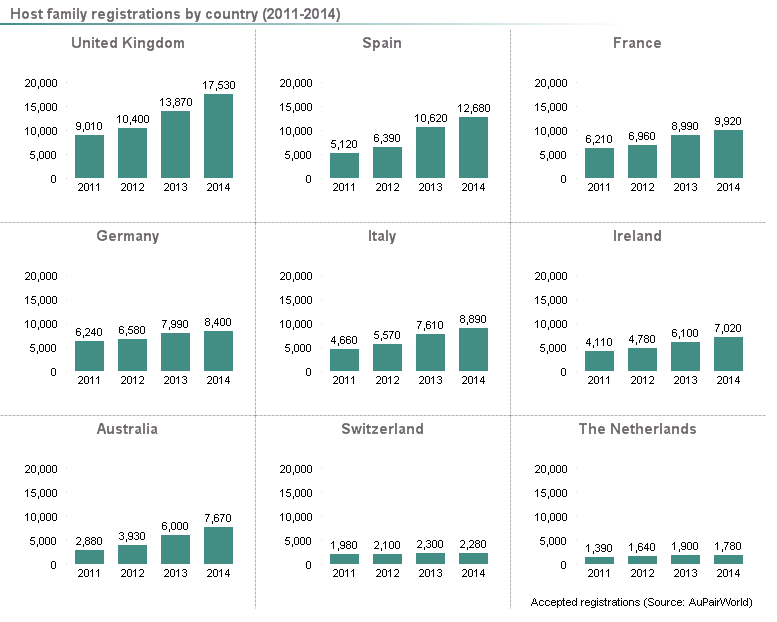 Host family registrations increased in Great Britain by 26% to 17,530, in Ireland by 15% to 7,020, and in Australia by 28% to 7,670. Italy and Spain also showed above average increases at 17% and 19%, respectively.